You can fit it and test it to see if it's working by hand once you have it out of the bike. I might have one laying about to send to you if needed. That's really kind of you Jon, I really appreciate the offer - but I've ascertained that I can get a KTM unit here quite easily at an affordable price. But can you explain the testing proceedure in a few words for me, please? Well, with the sprag clutch in the flywheel, and the starting gear behind the flywheel also removed, and with the sprag clutch and flywheel sitting on the starting gear and held in my hand, the flywheel rotates freely and easily without noise in one direction, but not the other. I guess that's not where the problem lies, then. So I'll put it all together, press the starter again, and try to get a better reading on the noise. The only trouble is, having had the sprag clutch in and out of the flywheel a few times without thinking too much about it, I'm not sure which way it should go in. I can probably figure it out, but which way should the flywheel rotate freely in respect to the starting gear? At this stage I'm guessing it's anticlockwise. 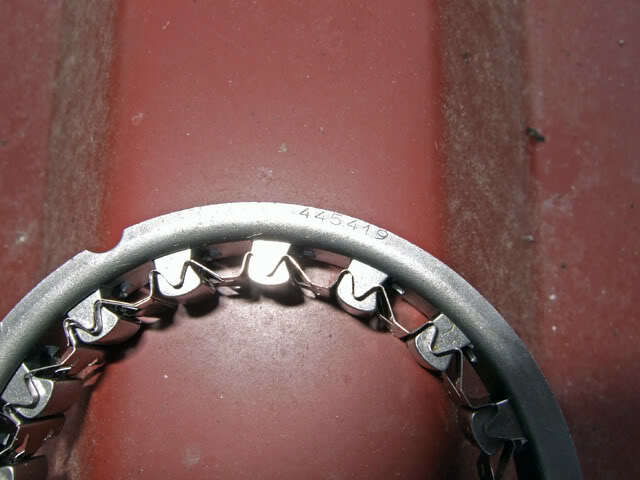 That sprag clutch looks quite worn to me as well, not only on the single part. You cannot test it properly by hand, since the acting forces during a real start are much greater than what you can accomplish by hand. I've seen perfect working sprags fail after a head rebuild and new piston rings, where suddenly the bike had full compression again. That reinforces my feeling that although the unit tests OK when held in the hand, it probably does need replacing. I can't imagine anything else that would make the kind of noise I heard. At $NZ140 (EU79) I think it makes sense to put a KTM unit in, and see if that solves the problem. I would have thought that the transmission from starter to the crank ,being a train of gears and this clutch that if the starter turns but the crank doesn't it would have to be either the sprag clutch, or teeth missing of gears, which would be bloody obvious. CORRECTION: That KTM clutch seems to be the wrong unit for the 750, although I believe it will suit a 906. It's too big for the 750. Apparently the original 750 starter clutches are no longer available from Italy. I'm trying Gowanloch in Australia to see if they can help. It says in the interchangeability list that it is a replacement for the 906. I found this. It says that 860GTS/MHR & belt driven 500-750 use the same one. I was told the original part is from BorgWarner if that is of any help. You need to test it to be absolutely sure it is in the right way. The motor rotates backwards, meaning that if you are looking at the motor with the cover off, it goes clockwise. The sprag bearing sits in the flywheel and the drive gear is stationary. While looking at the motor with the flywheel and drive gear in place, the drive gear must catch when trying to turn it clockwise. 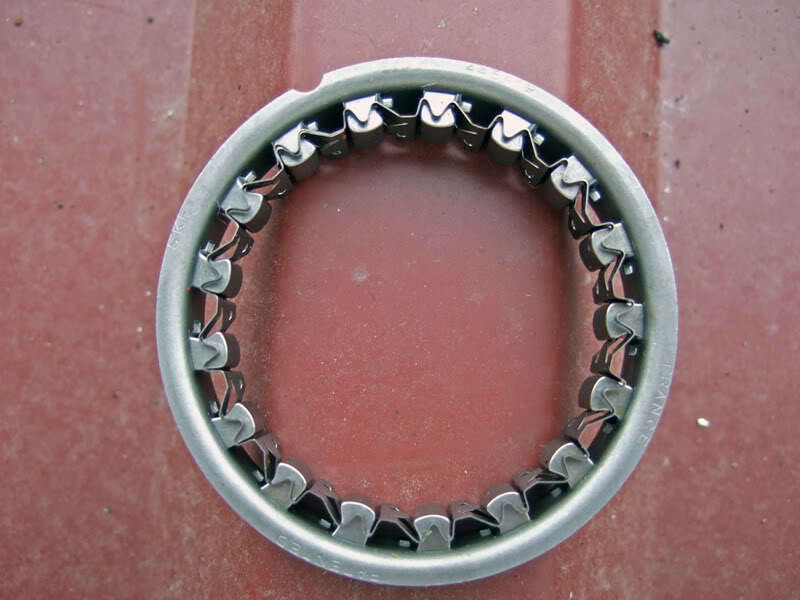 So therefore if you have the flywheel sitting in your hand, sprag already in it, then you drop the drive gear down into place,(so you are looking from the back now), it will catch while trying to rotate the drive gear anticlockwise. I checked my spare. I bought it from a guy who put it up for sale in the forum longer time ago. The number on it is SKF 445419. Strangely I can´t find anything on the internet about it. Maybe a bearing shop can. Gosh, that rotation business is confusing when you see it written down! Hi, gents. A couple of years ago I replaced the sprag clutch with one of a mini '69 (small car). It'll cost you a lot less and it's 99,9% the same. Only the outer diameter (small lip on the casing) needs milling for 0,5mm in diameter. Since this will not move once installed I used a conventional drill. It's in there for over 6000 miles. Not once a 'rattle'. Still enjoying the paso the most. Just changed to new tires (bridgestone) with a santa monica front sprocket. This one is 12mm offset. Works perfectly! Never had this amount of grip Modern bikes can't keep up while cornering..